One of the highlights of our summer road trip in France was drinking wine with our grandparents. Grandpa is 91 and Grandma is 85! Jason and I can only hope to be as fortunate as them traveling and enjoying wine around the world at their age! 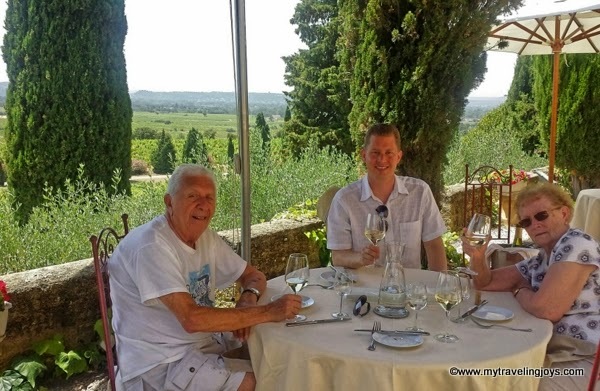 One of grandpa’s “last” wishes was to visit Châteauneuf-du-Pape and drink as much of this world famous wine as he could surrounded by vineyards as far as the eye could see. We set out to make that wish come true! I organized a private, half-day wine tasting and tour through our kind bed and breakfast owner, Linda Field of Auberge du Vin. Linda, a longtime certified educator through the Wine & Spirit Education Trust, started out by explaining some of the basics of French wines and the French wine regions or appellations. Our first stop was at the family-run estate of Domaine de Beaurenard, which has been making wine in the town of Châteauneuf-du-Pape for seven generations. The estate covers 32 hectares in Châteauneuf-du-Pape and 25 hectares in the Côtes du Rhône Villages Rasteau AOC area. Linda gave us a personal tour of the winery itself, and then we tasted several of the Beaurenard wines, including an uncommon white Châteauneuf-du-Pape. Grandma loved this white wine so much we had to buy a bottle at the end our tasting. 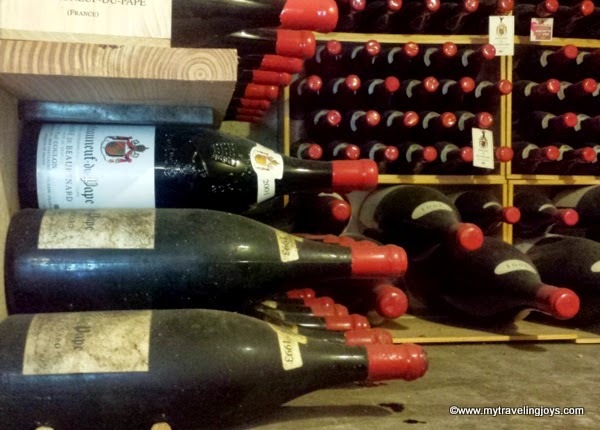 I also couldn’t help but covet the older bottles of Pope’s Château Châteauneuf-du-Pape covered in a thick layer of dust behind a glass-enclosed wine cellar. I first learned about this famous wine when I was working at a Michelin-starred restaurant in NYC, and it’s been served in all the restaurants I worked at since then. Unfortunately in the U.S., a bottle of Châteauneuf-du-Pape isn’t very affordable. I wish we had driven our own car to France so we could have bought many cases of this wine! Next, we headed to the ruins of the Pope’s Château, a grand summer residence originally built in 1333 during the period of the Avignon Papacy, atop a hill. The pope certainly had a lovely view over the Rhône Valley. We did a quick peak around and then slowly made our way down some rocky stairs, which was a little difficult for our grandparents. Then, we participated in another wine tasting at Cave du Verger des Papes, a wine cellar located underneath the old château. Again, we tasted another dry, white and a couple of fruity red Châteauneuf-du-Pape wines. We learned none of the white wines are ever exported out of France, so if you try one and like it, buy a bottle like we did! 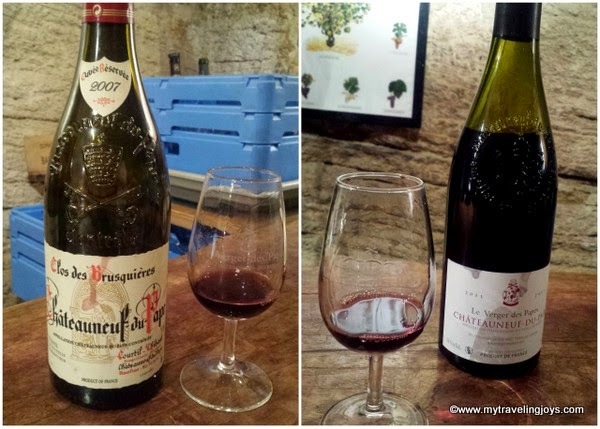 I really love the Châteauneuf-du-Pape red wines! 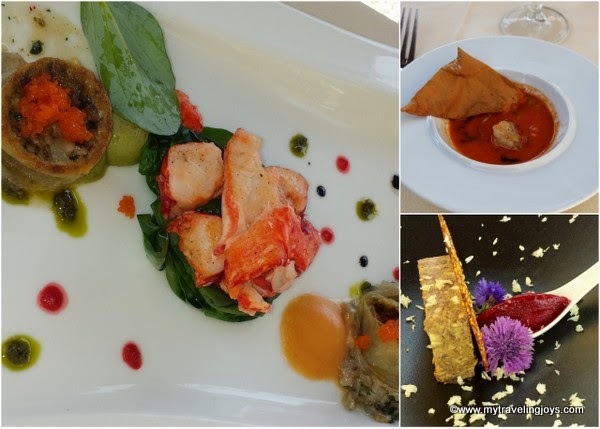 After spending our morning sampling wines, it was time for lunch at Hostellerie du Château Fines Roches, a fancy Michelin-Guide-recommended restaurant and castle-looking hotel located just outside of Châteauneuf-du-Pape. The restaurant features a panoramic terrace overlooking the surrounding lush vineyards. I’d say you found paradise, albeit slightly expensive, if you dined here! From this point, we were on our own. Dining at a "castle" surrounded by French vineyards - what's not to like? Our grandparents enjoyed the lovely view and more wine, but not the food as much as we did. As the trip progressed, we discovered they simply did not like French food, AT ALL, which shocked me. However, hubby and I both love French food, and I hope we still do when we are their age! At least, hubby's grandparents liked the French wine! The chef’s amuse-bouche featured “lollipop-like” foie gras coated in praline pieces. Pure decadence! 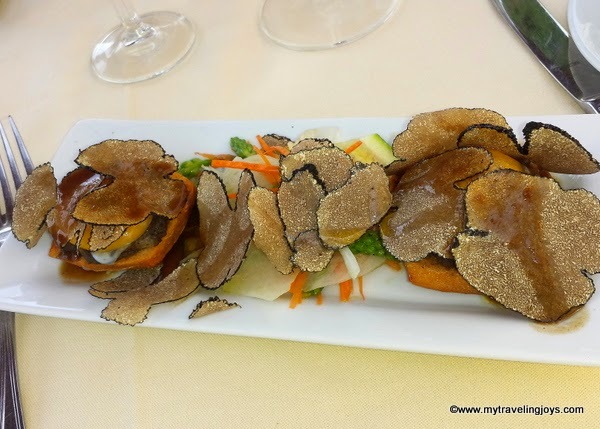 Our grandparents both ordered a lobster dish (although they just wanted soup), hubby had a terrine of guinea fowl with a red beet sorbet and I had the best dish – two poached eggs smothered in summer French truffles! For dessert, I couldn’t resist trying a elegantly-plated torte featuring French strawberries and pistachio crémeux, served with a strawberry sorbet. To me, this dessert represented summer on a plate! Grandpa (finally) enjoyed his vanilla panna cotta too! All of this fancy food comes at a price, about 50 euros per person, including a 2012 bottle of local Domaine de Nalys white wine. We don’t mind splurging now and then especially for a decadent meal like this one! If you’re traveling with elderly grandparents like we did, I highly recommend doing a private wine tasting tour, which allowed us to travel at our own pace. In the end, Grandpa was happy because he finally had his wish come true of drinking Châteauneuf-du-Pape wines in France; and that’s all that matters! Sigh! More vineyards near Châteauneuf-du-Pape. I am seriously impressed by your grandparents. What a great spirit (and physique!) to travel at that age. They definitely look younger on your photos. Food looks delicious. How restaurants gain Michelin-recommended status? Is it at the end better than Michelin-starred considering an investment it requires (read somewhere that Michelin-starred restaurants work at 10% profit, once all costs of running such a place are deducted). @Frank, Thanks! Yes, we are very fortunate to still have such healthy grandparents!